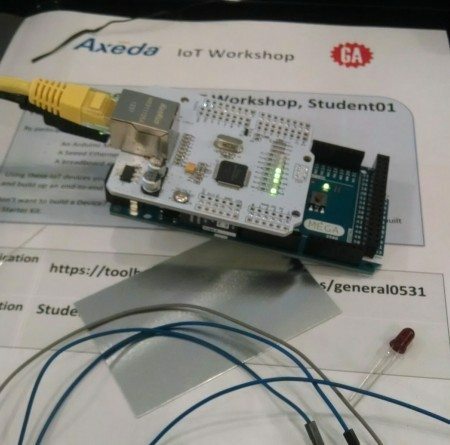 This past weekend, MachNation was fortunate to attend Axeda’s The Internet of Things: Hands-on Development Workshop at General Assembly’s Boston campus. In just one afternoon (even pausing for lunch) MachNation had put together an IoT device that reported sensor data to an instance of the Axeda platform. With guidance from Axeda’s Director of Developer Enablement, Kevin Holbrook, and colleagues, MachNation followed the ‘Connectivity Track’ along with other students where we built an IoT device. 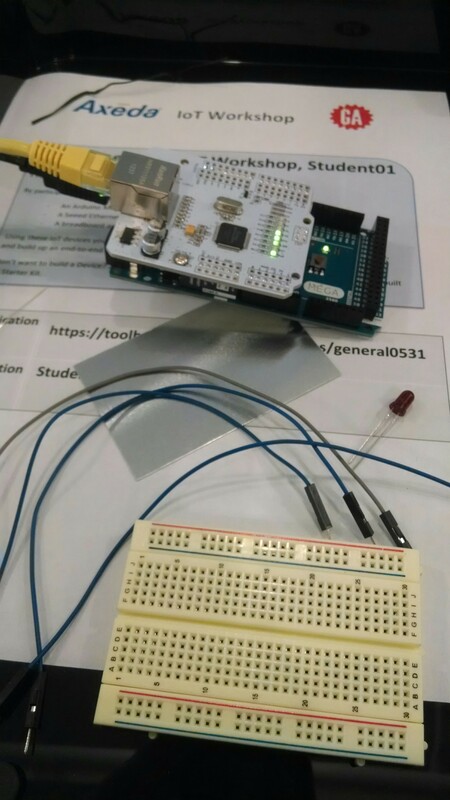 The other half of the class followed the ‘App Track’ where the team built an IoT application to monitor an already existing feed of sensor data. Our connectivity track team began with an IoT device kit containing an Arduino Mega 2560, an ethernet module, an LED and some wires. Later on in the day, we picked up an obstruction sensor to add to our device. First off, we spent time familiarizing ourselves with the Arduino microcontroller board, a mini-computer used for rapid prototyping. We installed the necessary IDE, got the Arduino talking to the PC via USB, and built a basic circuit to get the LED lit. Then, we used a sample of Axeda’s client-side SDK to get the Arduino device talking to an instance of the Axeda platform, passing static data from the device and viewing it using a pre-built web application. After a hearty lunch from Flour Bakery, it was time to connect a sensor to our Arduino device feeding data to the platform. We chose an obstruction sensor that allows us to detect when there was something in the way of the sensor, much like the sensors used by ‘park assist’ features of newer cars. Without much trouble, we were able to feed data captured by the sensor directly to the Axeda platform and display the obstruction using a pre-built JS/HTML application. In just a couple of hours with the IoT experts from Axeda, we built a functional prototype of a connected device and even got to take it home with us. Now if only we could figure out how to get this device to drag the trash bins to the curb on Thursday evenings!